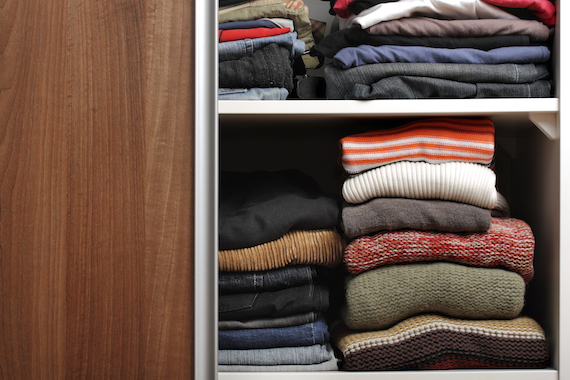 The last thing we want to think about in spring is storing our clothes for winter. But a little planning can save you a lot of stress. So now that you’re ready to trade in sweatshirts for short shorts, take some time to put away your winter clothes properly to ensure they’re ready to go next season. Invest in large plastic bins but NEVER store clothes in the plastic from the dry cleaners. Pack delicates in a separate container and wrap them in toxic-free tissue paper first. NEVER hang your sweaters or coats for the entire spring season — the garments will stretch. When storing furs, it’s best to have them professionally handled for the season. Store boots lined with newspaper so they don’t lose their shape. Use blocks of cedar wood instead of mothballs to fight against insect infestation. In general, you should abide by what is known as “CCDD” — cool, clean, dark and dry. Make sure that the final place you put your winter clothes fits within these guidelines. Exposure to sunlight or moisture puts your threads at risk. By following these simple tips, you’re sure to keep your winter clothes in top condition during the spring and summer. And when fall and winter come back around, your wardrobe will be ready!